You’ve heard it over and over from content writing gurus: "Write like you talk." How can you write conversationally after Mrs. Rodgers drilled proper grammatical construction into the core of your being during eighth grade language arts class? Readers expect a conversational style when they read an email, web page, text, blog, social media post – anything online. They’re used to commenting on blogs and interacting with pop ups and apps. Conversational writing is also the norm when readers see ads, direct mail, and consumer newsletters. You’ll be most successful at web writing and copywriting when you foster two-way interaction - that is, when you write conversationally - with your reader. You want to write in such a way that she has a discussion with you, whether it’s in her head or on the screen. Yes, you can make the leap with just a bit of practical help. 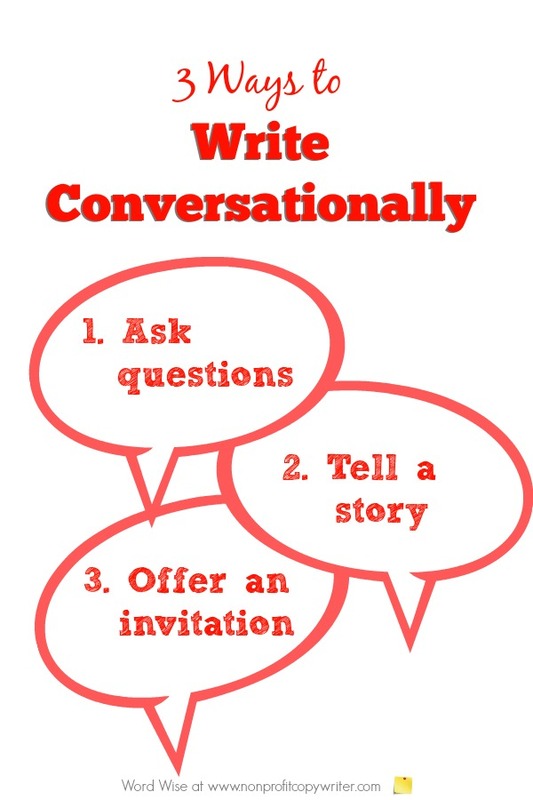 Here are 3 of my favorite ways to write conversationally online. Call them “writing methods” or “writing techniques.” Whatever. They work! You mentally respond. Perhaps you may even type a quick answer if you’re online, on a blog, on a social media site, or reading an email. Asking questions sparks conversation in person. It does the same thing online, too. It’s an easy technique. Skim this page and see how many times I ask questions. See what I mean? Pulled you in, didn’t it? You may identify with my friend and you may want to know more. You may want to know what was going on at my friend’s work. You may want to know what she’s journaling about now. You may want to comment about how journaling was a turning point for you, too. The story is a hook that engages you. Engagement = conversation. It doesn’t have to be a big story with multiple characters and several plot lines. In fact, short anecdotes work best to engage readers. Or if you’re into figuring out the mechanics of online conversational writing, check out this post with some practical tips. Do you see what just happened? I invited you to learn more. I told you where and what and who and how. When you offer your reader an invitation, you’re taking the first step in building a relationship. Which is the whole idea behind conversational copywriting. Isn’t it?